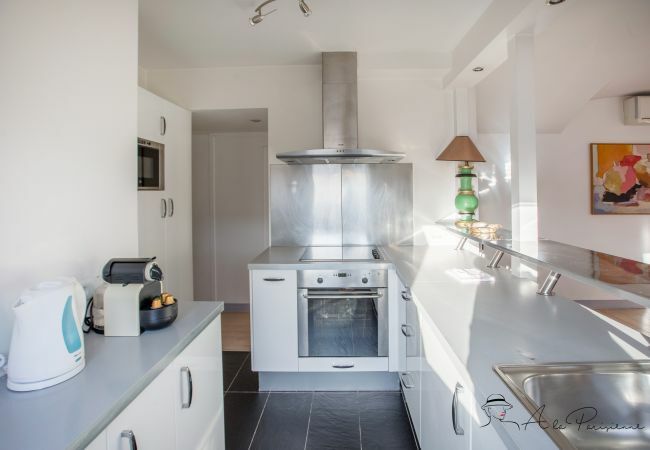 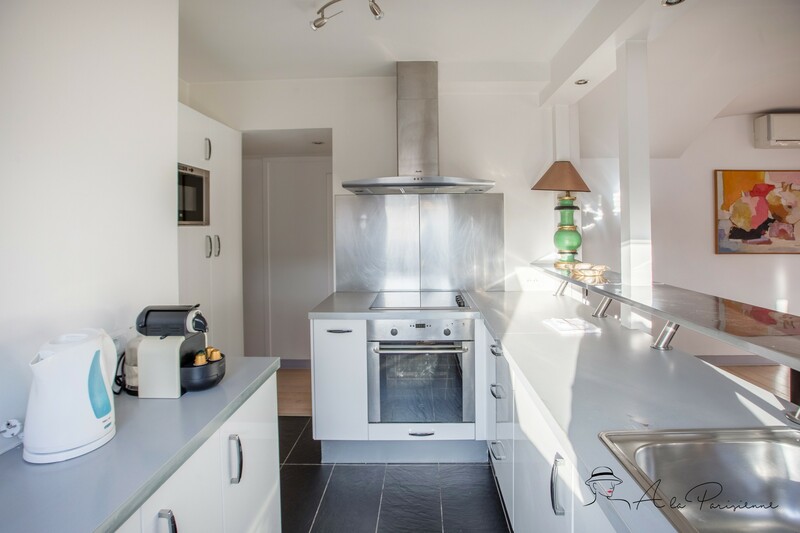 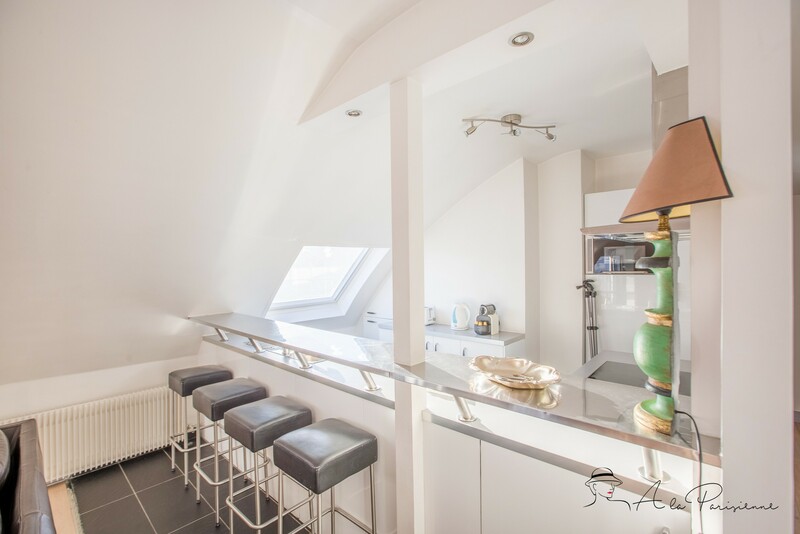 * From 01st of March of 2019: minimum 12 months rent with a monthly amount of 4500 € + 50€ electricity + annual insurance + 35 € internet / TV / Telephone + security deposit of 1 month rent + 1 month rental of agency fee. 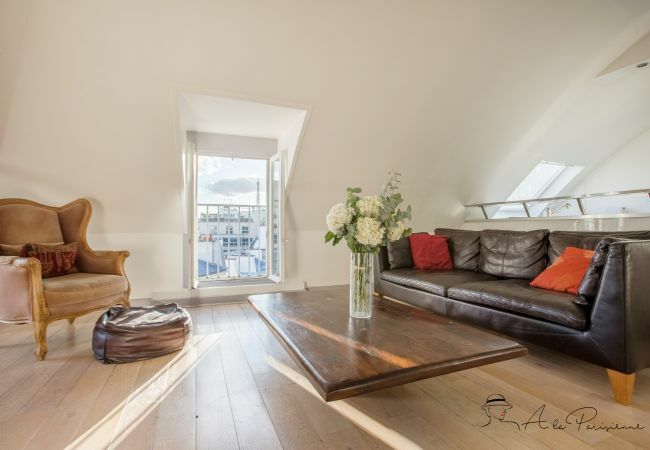 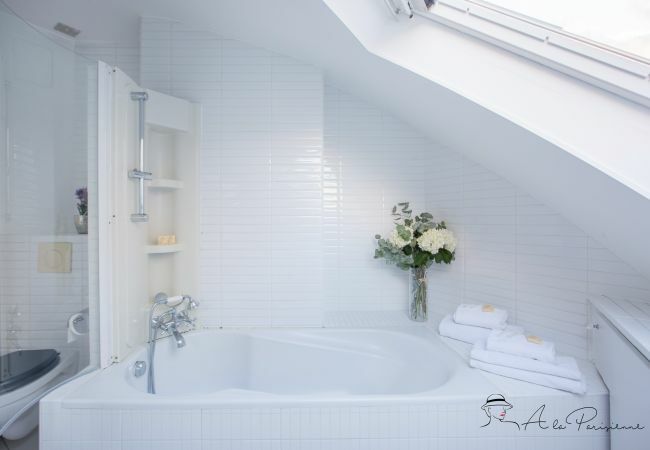 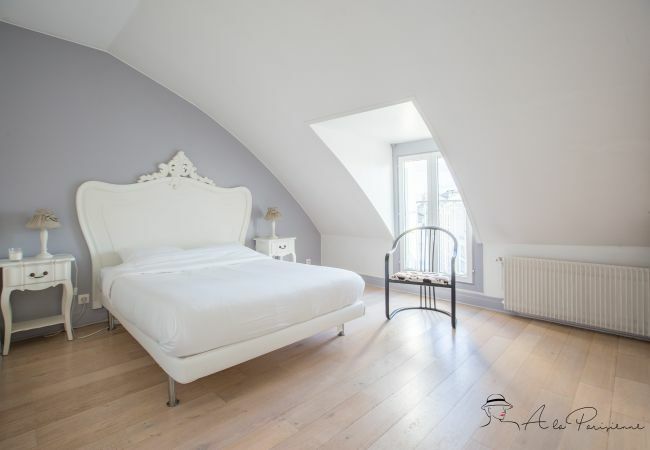 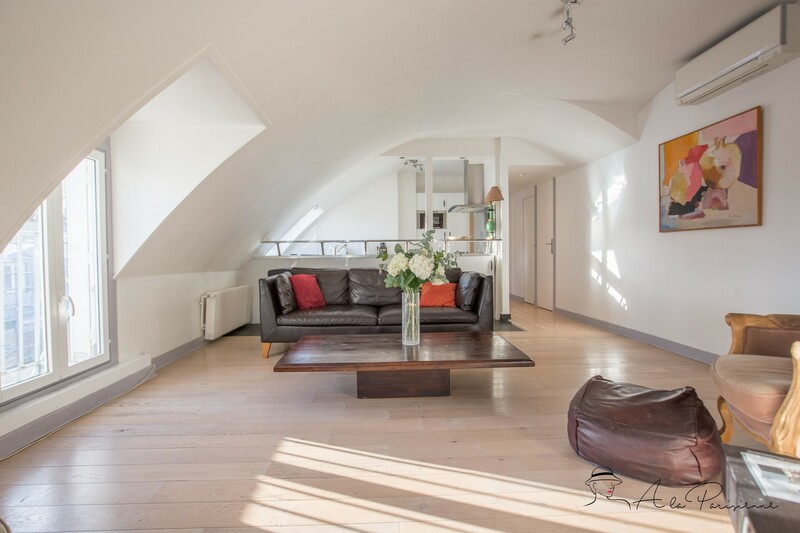 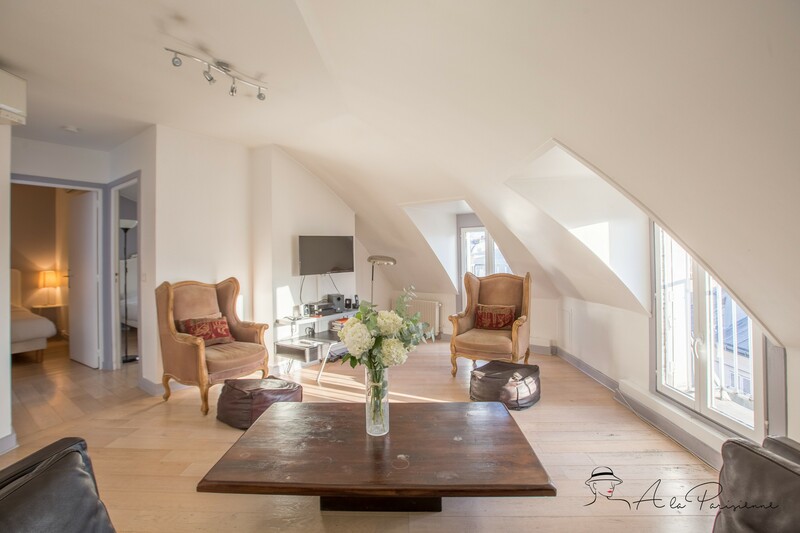 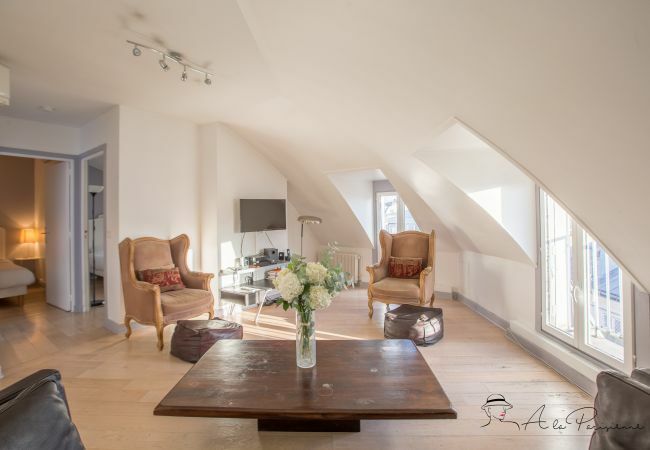 Spacious and confortable two bedroom apartment of 90 square meters (969 ft2), located right next to Champs-Elysées Avenue, at the 6th and last floor of a beautiful ancient building (with elevator). 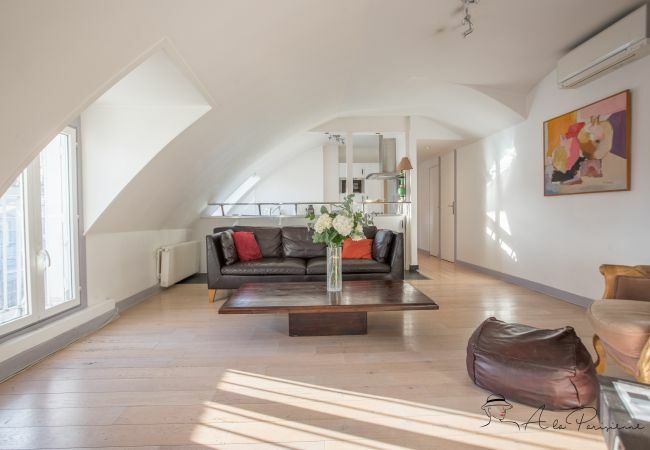 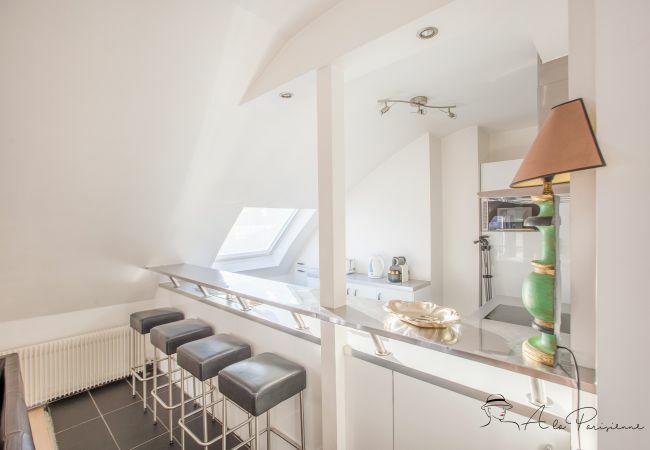 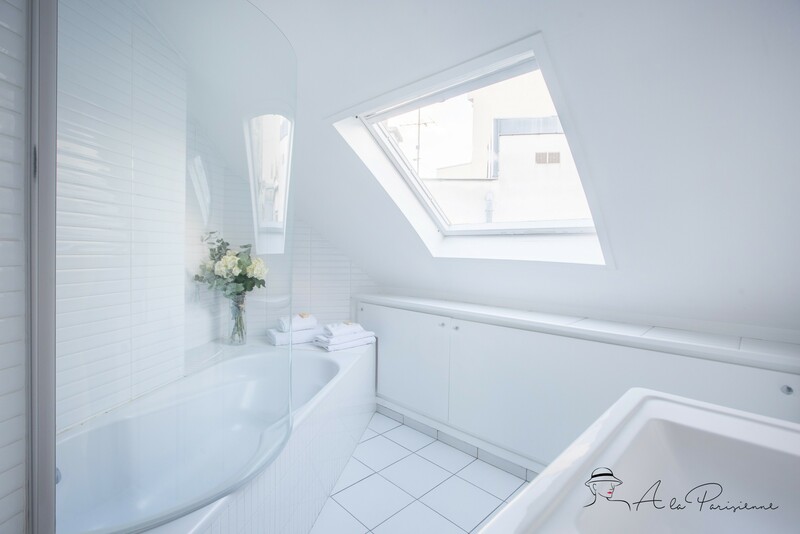 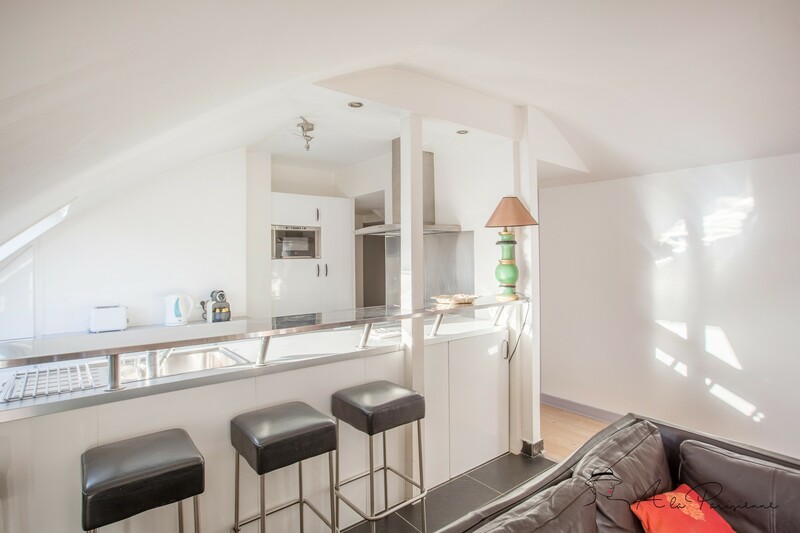 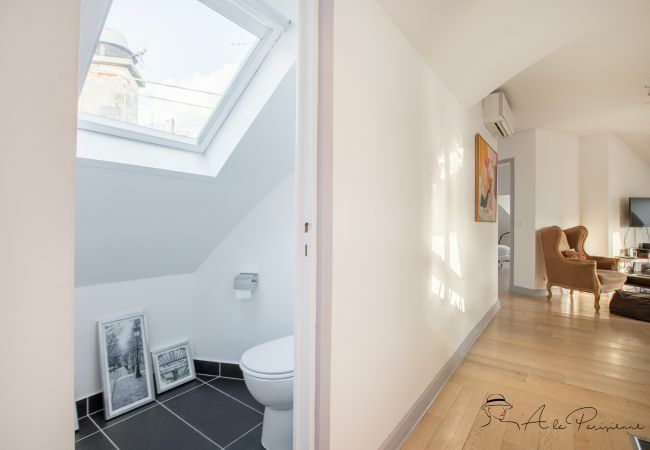 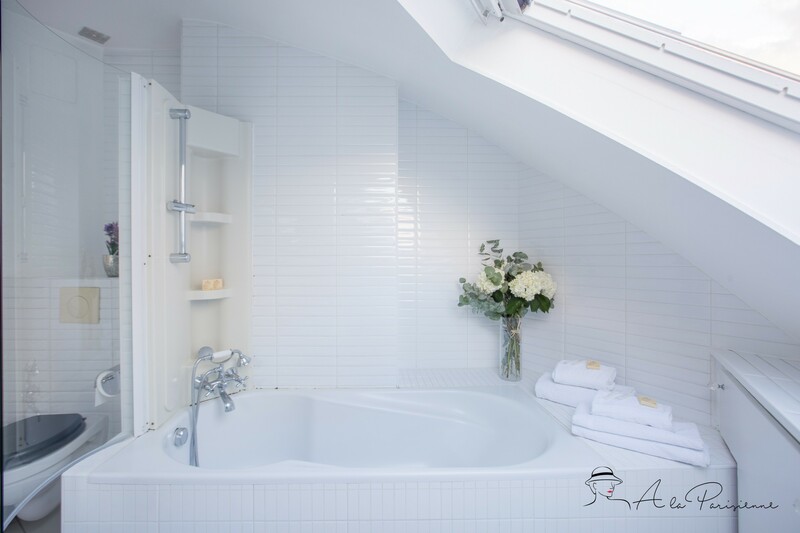 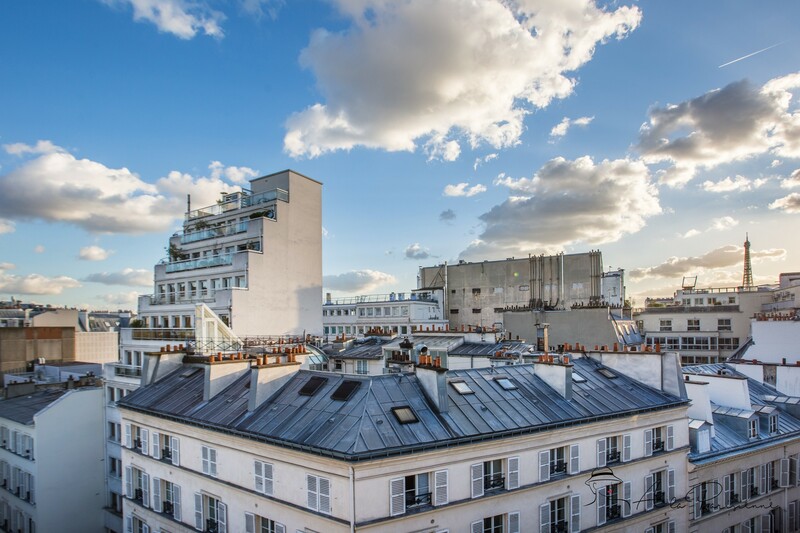 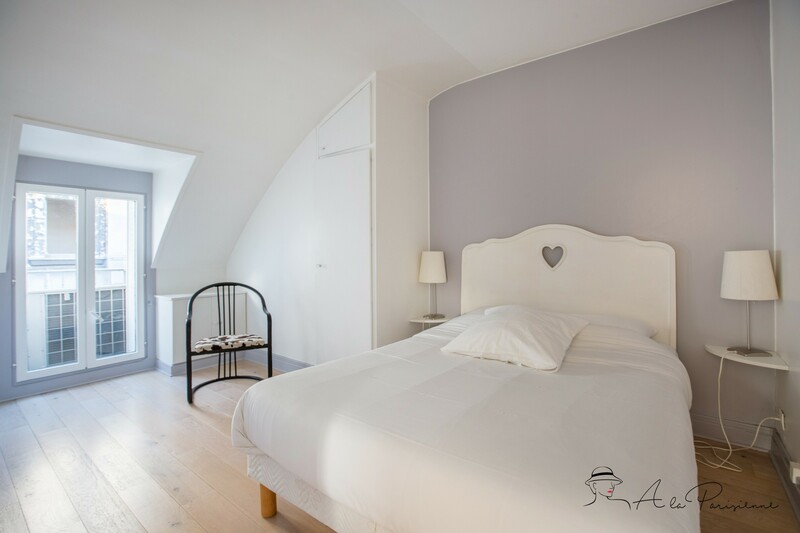 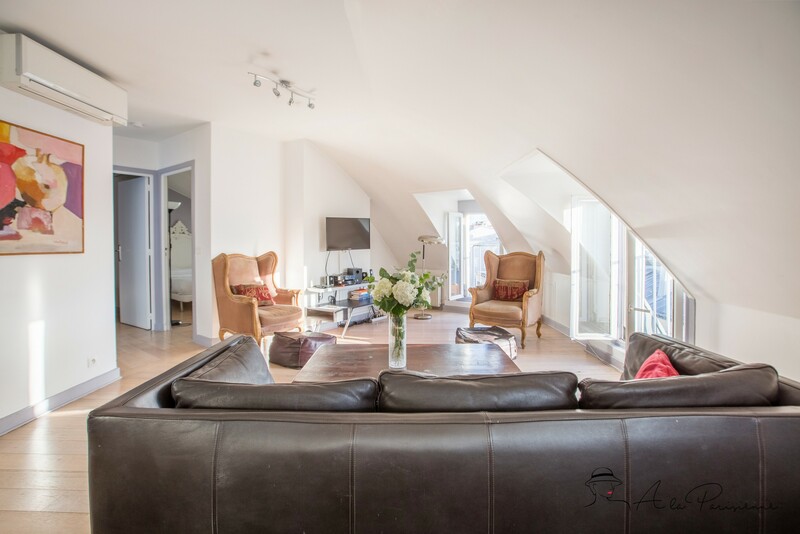 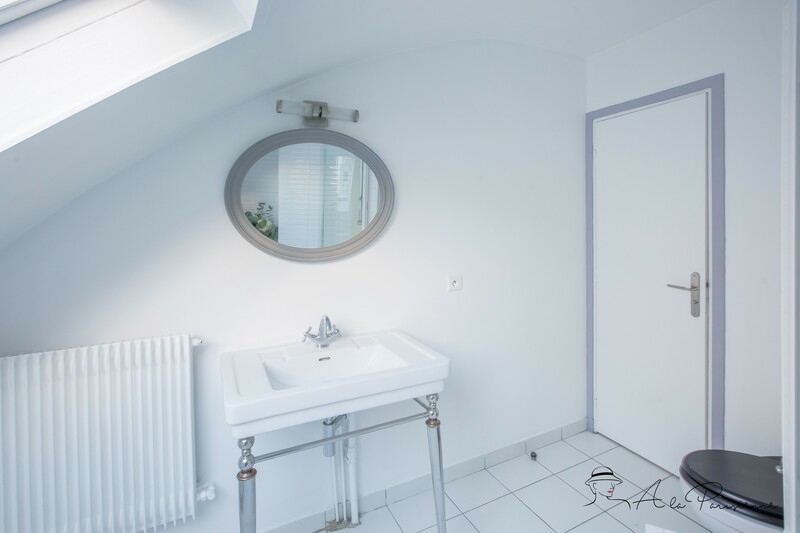 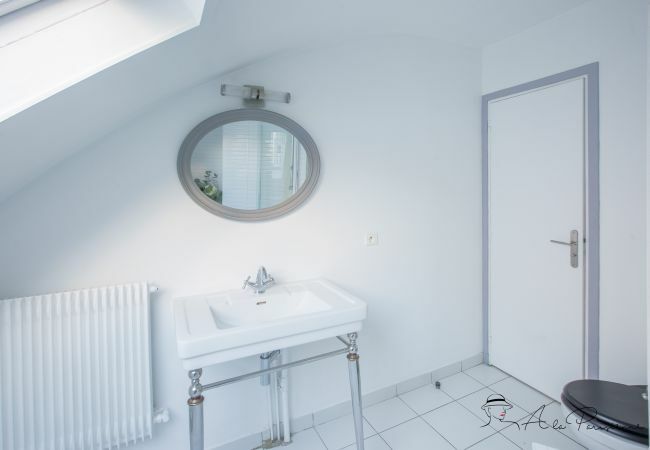 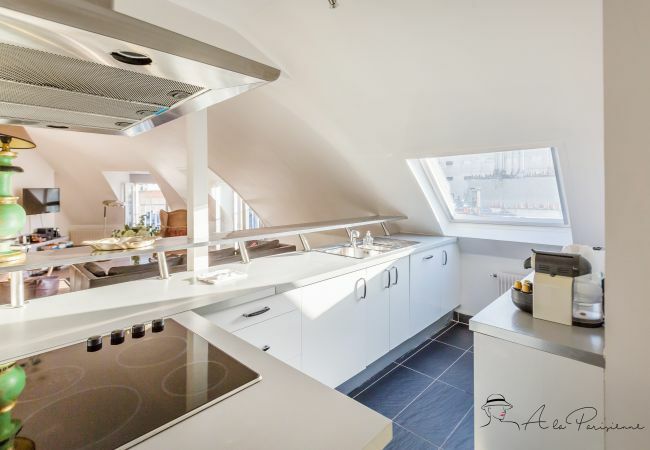 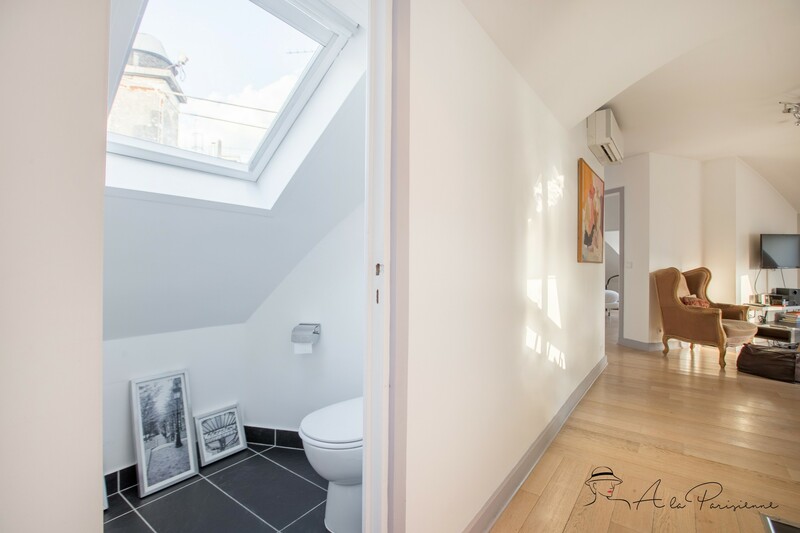 This flat offers two bedrooms, a full bathroom, a second toilet, an opened kitchen and a living room, which has a very nice view on Paris roofs and the Eiffel Tower (that can also be gazed from little balconies). 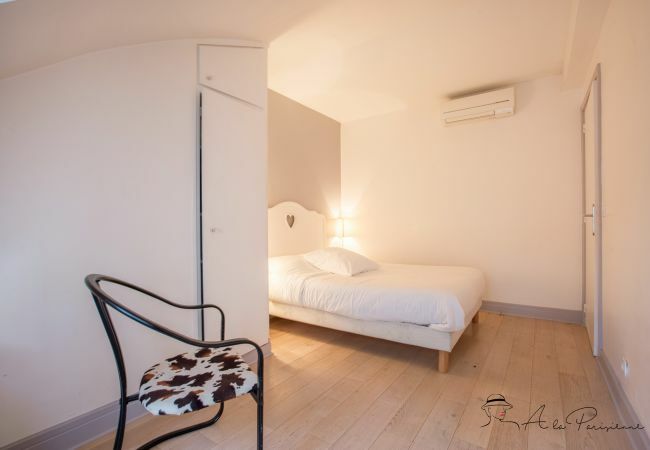 It has wooden floors, is very bright and decorated with taste. 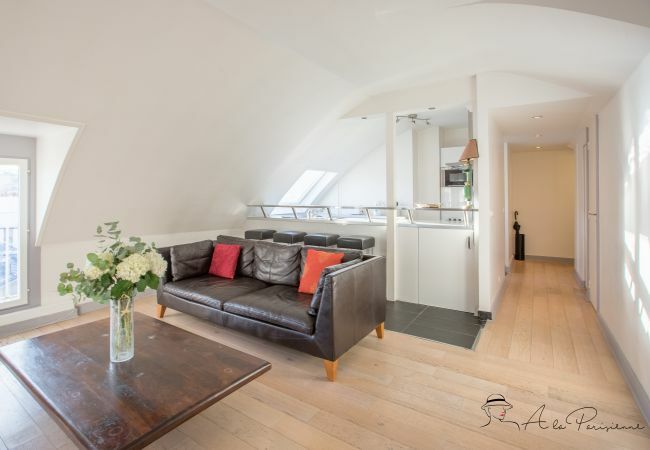 Fully equipped and air conditioned, this apartment can very comfortably host up to 4 people. 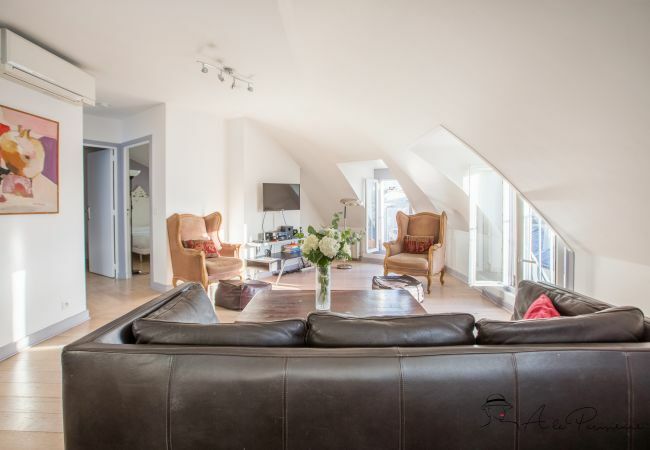 The living room has a large couch and two “bergère” armchairs, a bar with a freezer, a LCD TV with access to international broadcasting and a dvd/blue ray disc player. 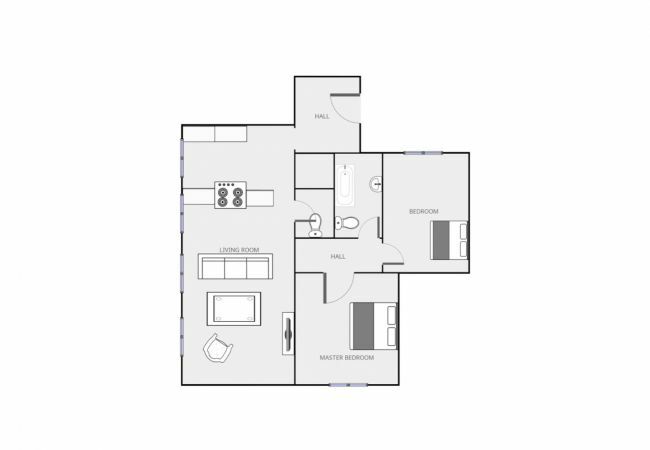 Both bedrooms have double regular beds and closets. 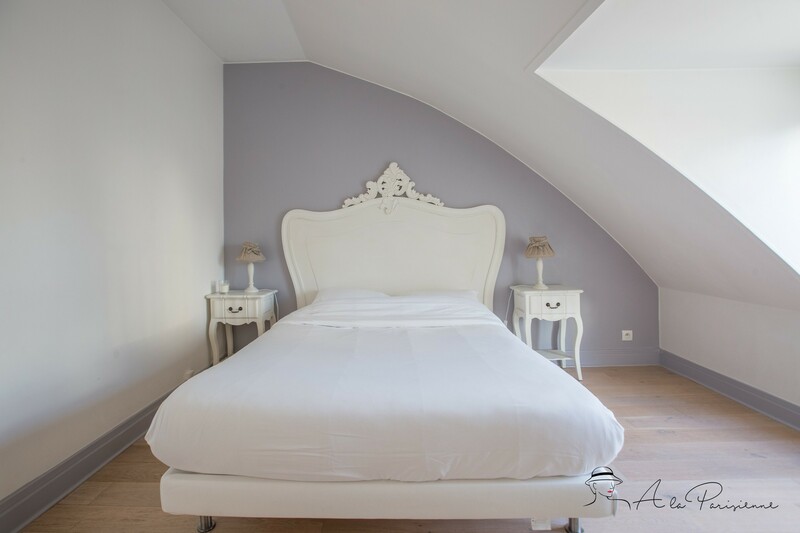 One safe on the second bedroom. 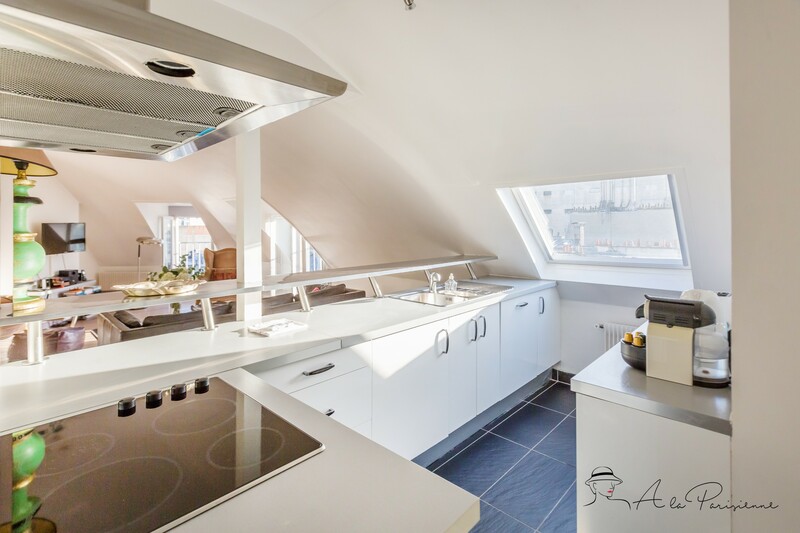 The kitchen is set with all classical equipment including a glass-ceramic cooktop, an electric hoven, a microwave hoven, a refrigerator, a dishwasher, a washing machine, a toaster etc. 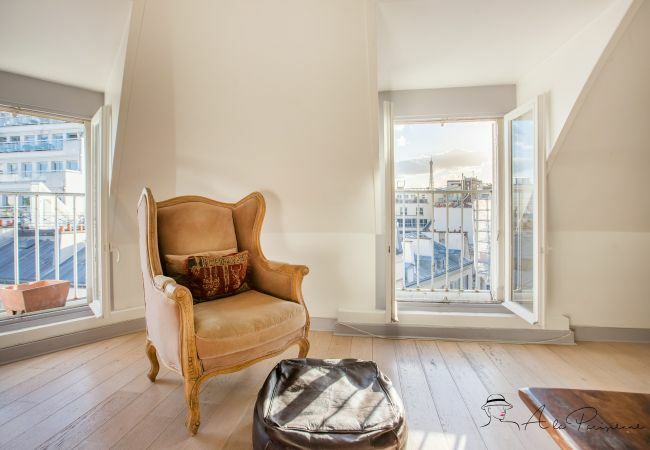 This flat is ideal for tourists who wish to stay in the heart of Paris, at the corner of “the most beautiful avenue in the world”. 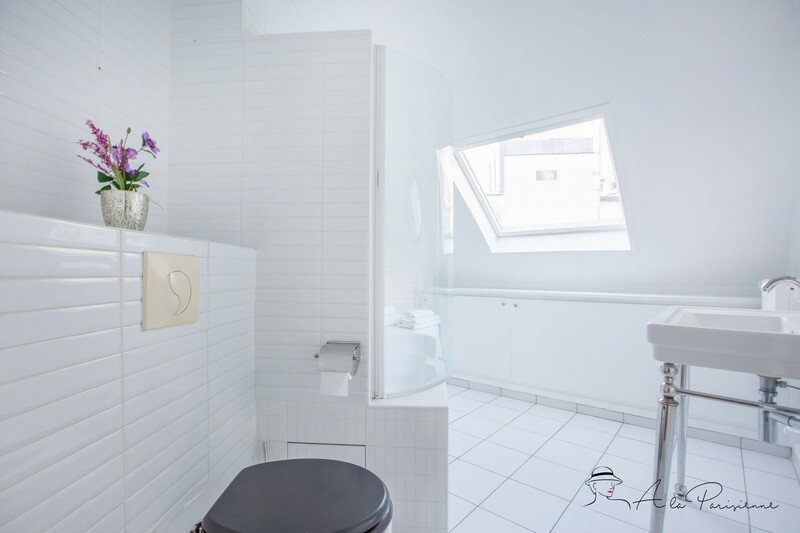 It is also a perfect base for a business trip. 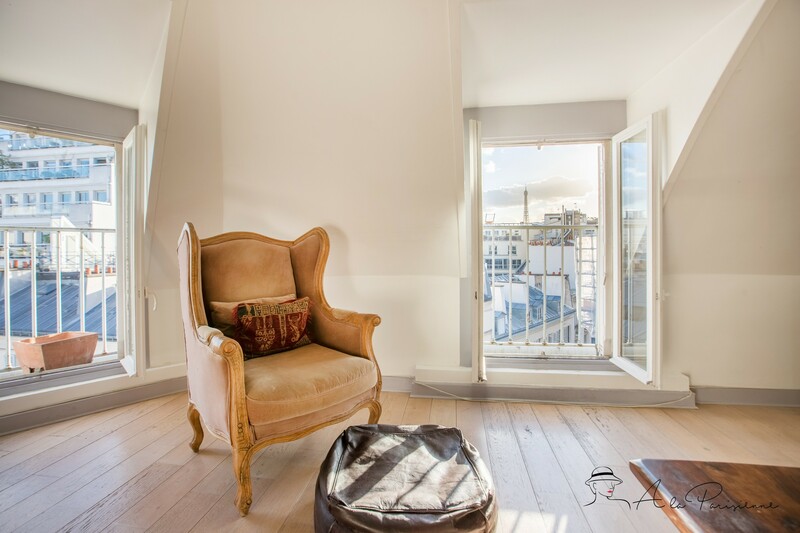 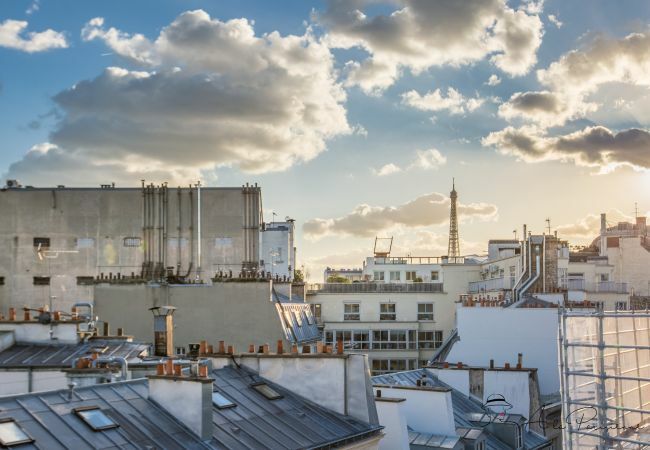 While being right next to all the attractions of the most renowned avenue of Paris, it is located in a very pleasant street where one can find many cosy cafés, a “boulangerie”, a little supermarket and other useful local shops. 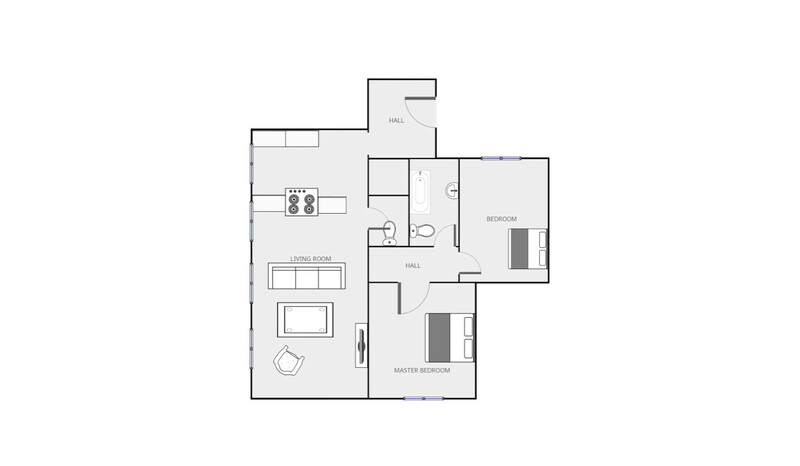 It is also very near public transportation (metro and bus). 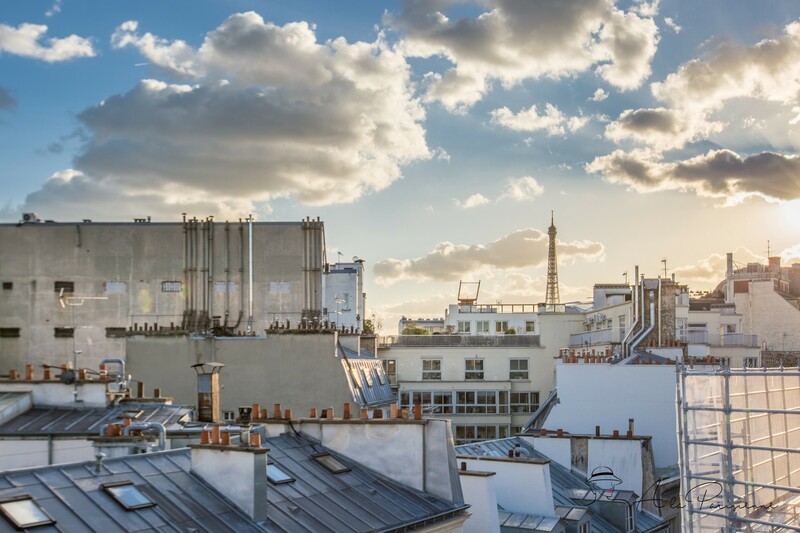 The Champs Elysées quarter is famous for its magnificent monuments such as “Arc de Triomphe” or “Grand Palais”, as well as its sumptuous avenues and grand squares, amongst most renowned are “La Condorde” and “L’Etoile”, which opens and closes Champs Elysées Avenue. 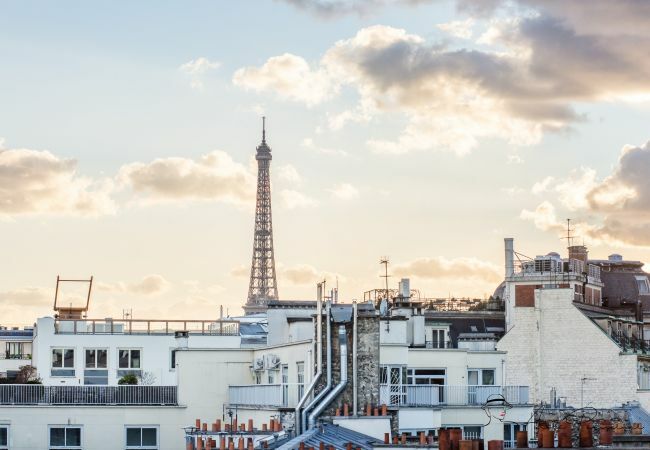 There can be found most of the great Parisian restaurants, hotels and boutiques as well as famous theatres and cabarets (those of “Rond-Point”, “Champs Elysées”, “Madeleine”, “Lido”, “Crazy Horse”). Champs Elysées is also the neighbourhood of the Palaces of the French Republic, and that of the President, which is right next to the Avenue and was named after it. 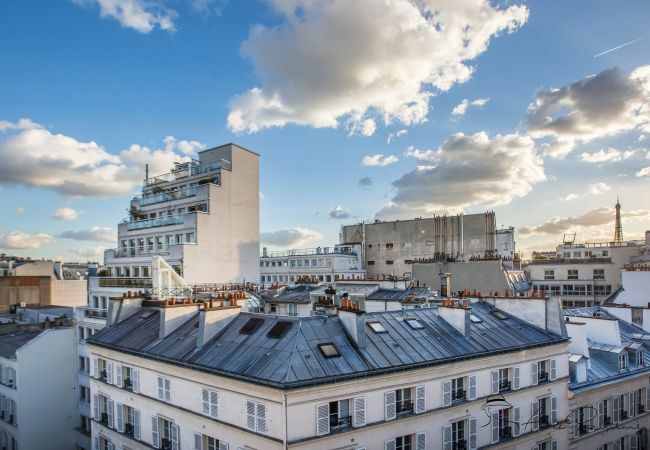 This « arrondissement » is surrounded by parks and gardens, such as « Parc Monceau », « les Invalides », « le Jardin des Tuileries » (in front of the Louvre) and, last but not least, « le Champ de Mars », where stands the Eiffel Tower. - 1 Bathroom with bathtub, 1 Bathroom with shower, 2 Toilets. 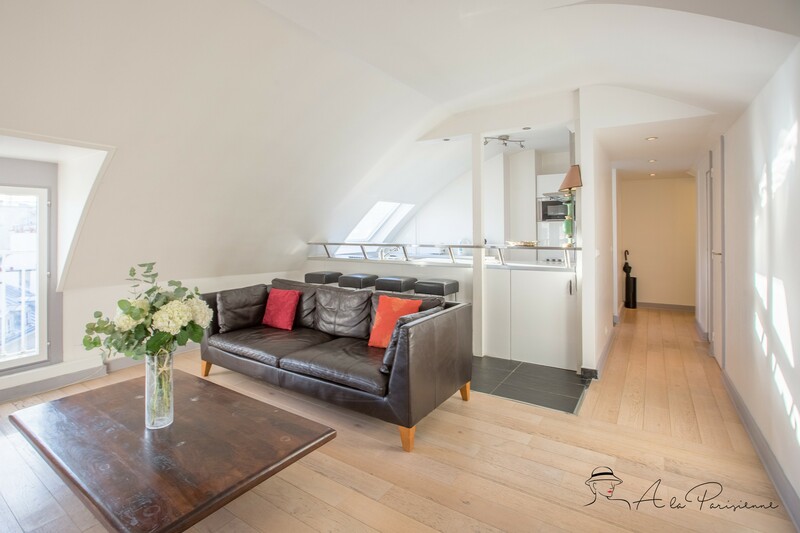 - 1 TV, 6rd floor, lift, iron, internet (Wi-Fi), balcony, 90 m² property, central heating, air-conditioned, 2 fans.